This meme is hosted by The Broke and The Bookish. -Julie Kagawa - The immortal rules. -Carrie Ryan - The forest of hands and teeth. -Kat Zhang - What's left of me. -Courtney Summers - This is not a test. -Robin LaFevers - Grave Mercy. -Leigh Bardugo - Shadow and bone. -Rae Carson - The girl of fire and thorns. -Sarah J. Maas - Throne of glass. I haven't read ANY of these yet! I've been telling myself over and over again that I must read CINDER soon, but so far I haven't. :( TIGER LILY, too, is a book I really want to check out, as well as SWEETLY and THE BOOK THIEF. I've heard awesome stuff about all these novels, so it's no wonder you're recommending them! Great list, Mel. Once I take myself out of my book buying ban, I'll get to these ASAP! I have to read Tiger Lily soon! Ever since I first saw it I've wanted too, but I still haven't. Love your list! I think a 100 books I recommend the most still wouldn't be enough, there are too my books I adore. 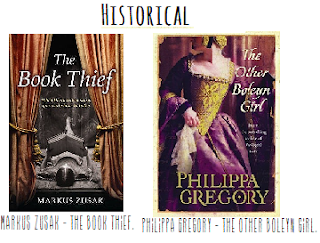 By the way I love both your historicals, The Book Thief is on Top Ten too. Great selections! I haven't read any of these but I would like too! Thanks for sharing! Oo I like how you split it up by genre! Many of these I still need to read. 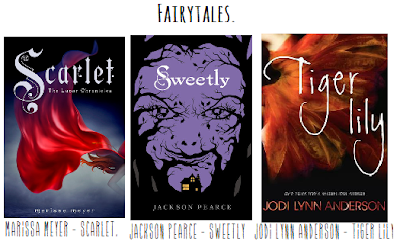 I am slowly exploring more fairy tale retellings - you are like my main source of info in this genre :). I definitely have my eye on Tiger Lily, The Immortal Rules, and Heart's Blood. Awh, that is cool :D! I LOVE all the fairytale books! There is just something about a good fairytale retelling that rocks my world! I still haven't read Tiger Lily, but I really enjoyed Scarlet! :) Thanks for stopping by my TTT list! I think you are going to love Tiger Lily. Juliet Marillier!! 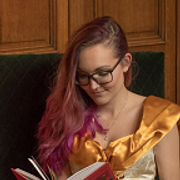 We seem to share that addiction ;) Love your taste in books Mel! I need to read Tiger Lily! It's been on my to-read forever! Great choices! I definitely recommend The Book Thief to loads of people, even if they don't think they'll enjoy reading it. Just read Scarlet :D In a single day. It was so phenomenal. I recommend those books to anyone, no matter what genre they like. It just encompasses all of them!! Yay for The Book Thief! It's such a wonderful book. I'm debating if I should pick up Scarlet or not because I didn't enjoy Cinder. But I've heard this one is better. I've heard good things about Tiger Lily so Ishould check it out sometime. Great list Mel! Thanks for stopping by my blog! I'm seeing The Book Thief all over the place. I still need to read it. And Tiger Lily. Eek, so many people this week are recommending The Book Thief and I am so ashamed I haven't read it yet! I have only read Juliet Marillier most recent YA release, so her books are other ones that I really need to get to! You have great taste, Mel!! Go change that! Soon :D! I had a tough time with this list too. So many great books to recommend! I adore Book Thief, The Other Boleyn Girl, and Cinder. Thanks for sharing! I still haven't read The Book Thief, if you can believe it! I even have a paperback on my shelf. I've got to do it soon! Love Marillier too! So many on here that I need to read!! The Book Thief, Entwined, Tiger Lily, Daughter of the Forest... Only one I've read before is Scarlet, I LOVE that series. Awesome list! I LOVE Scarlet and Entwined! I'm really looking forward to start The Book Thief! Also soon starting on Kagawa's books as well. I love all the fairytales!!! 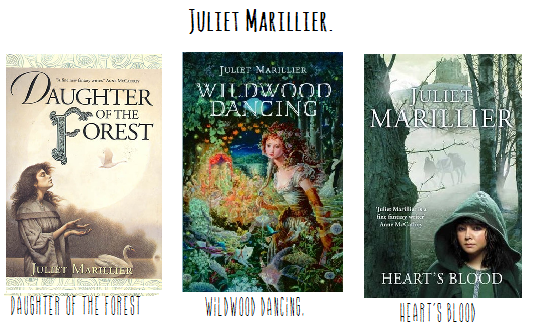 I really need to try out Juliet Marillier's books. I've heard absolutely wonderful things. I put Daughter of the Forest on hold the other day, and hope it comes in soon. I think the library will I work has WIldwood Dancing, so I might pick that one up tomorrow, too. OH AND Entwined has been a book I've been meaning to read FOREVER! What is taking me so long ??? Mel my dear!! Yes Im back! thank you so much!! Yoooooo! Im dying to read Juliet Marillie's novel, special the Seven Water series!! Great recommendations! thanks for sharin and Im taking note here of all the books! kyaaaaaa!! I am like the only person in the world who hasn't read a Juliet Marillier book! Wildwood Dancing is on my to-read list, though, and I do really want to get to it soon. Same with Entwined; I've had that on my Kindle for ages! This list is like... everything on my TBR list hahaha. I really need to get to Scarlet - think I'll be reading that this weekend. The Book Thief I really need to get around to. And I'm looking forward to reading Tiger Lily and Entwined :) Nice list! I really haven't read very many of these, and out of them only one really struck me with it's incredible-ness (but so many have such stunning covers! They're incredibly beautiful) and that is Tiger Lily- I read it last year and loved it so much, though I don't think I ever reviewed it which I really ought to because it's just so good! Great list, Mel! They're timeless classics and modern retellings bring such interesting and creative twists :) These all look so yummy >_< and the covers are SO pretty too! (cover junkie XD guilty) I've actually never read a Philippa Gregory book! :o but Tiger Lily blew me away as well! Showcase Sunday 26. Bargain books. Review 143. Dan Wells – Partials. Review 142. Debbie Viguié – Scarlet Moon. Review 141. Leigh Bardugo – Shadow and bone. Review 140. Tia Nevitt – The sevenfold spell. Review 139. Sarah Zettel – Dust girl. Top 10 Tuesday (27) Spring TBR list. Review 137. A.G Howard – Splintered. Review 136. Cynthia Hand – Boundless. Top 10 Tuesday (26) Series I want to read. Review 133. Anna Carey – Once. Take control of your TBR-pile Read-A-Thon.